It began for Bronwen Low after she saw her first teen slam (or “Mock Poetry Olympics” as she likes to put it) in 1999 at the Peoples Poetry Gathering on the lower eastside of New York. Kids from all over the burroughs gathered to compete, to cheer each other on, and recite their own words. 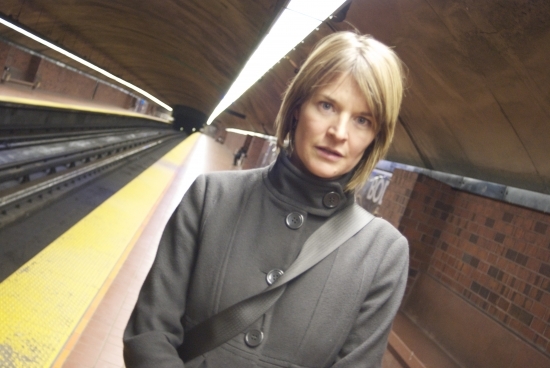 It changed Low’s view on youth and poetry completely and two years later she began collaborating with an English Language Arts teacher and a professional artist mentor to create a curriculum for educating youth through hip-hop history and slam poetry. These classes were designed to push conventions of traditional ELA teaching, to bend the rules of grammar and censorship, and offer a space for youth to learn about themselves and their peers through writing and performance. 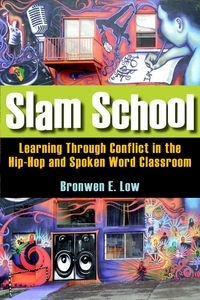 I first read Low’s book: “Learning through Conflict in the Hip Hop and Spoken Word Classroom” after it’s release at Drawn & Quarterly (Montreal) in May 2011. Now I have the opportunity to question Low from the perspective of a spoken word artist and educator who works with youth in the spoken word classroom, but has never been trained as a school teacher. LitLive: The book talks about different ways to look at voice? How would you define voice? LitLive: Within a slam curriculum did you use particular exercises to help students explore different voices? LitLive: The book discusses the difference between “Representin’ and Keepin’ it Real” as well as notions of a hip-hop “ego consciousness”. Is it appropriate to be narcissistic when you are beginning to write in order to find your authentic voice and express your experiences? By narcissism I mean looking at self, individual experience, and exaggerating, inflating or glorifying those experiences. “I agree with you that writing almost always starts with the self. We are interested in putting into language our thoughts and experiences. What a slam poetry curriculum can do is allow students a space in a classroom to do that work publicly amongst colleagues and with their teacher, and to share things they might not normally. Most importantly, it gives them a chance to do so in a language that often isn’t allowed in class, one that is everyday rather than academic or schooled. Our curriculum made a lot of links between spoken word traditions more generally, all the way through to hip-hop. Many of the students were African American and Latino, and almost everyone was either into hip-hop or even if they weren’t, it still shaped their experience. Everyone had a strong feeling or investment in hip-hop. Of course hip-hop, the self and self-promotion are all part of a very long tradition: the African American street vernacular poetic tradition around bragging rights. All of that crept into students slam poetry. LitLive:You were talking about using a language that is particular to the students, not always grammatically correct. How do we find space that is open for expression without violating the school’s politics or the students’ politics? As educators how can we work around censorship? “That became a really important theme for me, because as mentioned in the title, conflict is central to the book. Our classrooms were filled with debate, and one of those disagreements was language. In the Chapter “Tale of the talent night rap”, we discuss a student performance where one student’s act got cut short. According to the students the principle felt like cursing was inappropriate. That event spun off into many classroom conversations about language, audience and appropriateness. One thing often told by teachers, especially in the Montreal area, is that they tried to start a slam poetry event in their school, but language became too big a barrier. If the administration decides what isn’t tolerated in performance, students often feel they’re not offered a space for expression that is promised. At one point we tried to see how students would rate rap track lyrics, sort of like movie critics. They didn’t agree with the process at all, they’d either rate things a zero or a ten. What ended up happening was much more of a negotiation between teacher and student. Not all curse words are forbidden. But we worked with the phrase: “Don’t cast your pearls among swine.” Every word is a precious piece of language. Occasionally the perfect word fits with the rhyme, tone, etc. The teacher that I worked with had his own set of policies: classroom door is shut during workshops, with certain things being said in classroom that aren’t appropriate in the auditorium. LitLive: So the first step is to inspire youth to want to express themselves, but the issue has come up: who is this work going to be presented to and how are youth “representin’” themselves or “keepin’ it real”? I think you can have different standards of acceptability for what happens inside the class and what happens outside the class, in a conscious use of language. A key piece for learning is that these negotiations be accompanied by a discussion around audience, purpose, context. LitLive: There is a lot of coding that happens in the language that youth are using, which brings about a certain level of beauty and of hiding the real meaning. How did you work with coded language? LitLive: In thinking about hip-hop and spoken word expression, some say that you have to own the experience you are speaking of in order to be real about it. In owning those experiences, how do we also own the potential miscommunication and judgments others may have? I like the notion of language as a responsibility. It is really powerful and brings with it responsibility. This can help students and teachers think carefully about the language choices they are making or restricting. LitLive: What do you think are the biggest challenges that educators face when considering incorporating spoken word or slam curriculum into a classroom? Do you think it’s possible to create a completely integrated curriculum that benefits both educator and student? One challenge for teachers is how to make it fit in to the curriculum. Most provinces have oral competencies in English Language Arts, which is very helpful. We placed a lot of emphasis on the written poem that would then be performed so you have the transmediation moving from text to orality. I think, though, the more substantive barrier is that teachers sense that they don’t know enough. The model of the teaching artist is the perfect solution. When working in New York, we worked with a teaching artist. We benefited greatly from all of her expertise, and she also benefited from working with a teacher with a more traditional writing background. The book is very much about teacher learning and students learning. Not only does a teaching artist provide a huge support to the teacher but the teacher has to relinquish a certain amount of authority, which can be difficult especially in a climate around accountability and standards. Teachers can feel anxious about losing control and feel that students aren’t moving forwards towards meeting certain competencies. It’s important for the teacher to step outside of their comfort zone and enter into the role as facilitator and coach, rather than the one who knows. LitLive: So, we’re looking at collaboration as a basis for effectively bringing this type of curriculum into a classroom? Absolutely, collaboration with teaching artists and then also with students, in which students become people who know. curriculum which gives ties to traditional studies of literature and ELA curriculum. [See link below.] Writing mentorship is a great asset, however. LitLive: The book is based off of youth workshops in the U.S.A. What do you think the needs for Canadian schools are? LitLive: How did you work with students of varying literacy levels to get ideas on the page when the very notion of writing can be such a barrier to begin with? “It is a real problem, especially for many of the students who connect most powerfully to slam. We placed a lot of importance on written and spoken, actually crafting what you are going to say. Unlike freestyle, slam is carefully written in advance. In the moment of performance, the word is spoken. Prior to that you can emphasize the craft of writing, but make craft more pleasing and interesting for students who are more challenged by writing by showing how it gets more embodied in performance. LitLive: In the book you emphasize how important it is not to simply glorify successes, but to consider conflicts as seeds for growth. How can we, as spoken word mentors who aren’t trained as teachers, look at these conflicts as openings? “For one, people in the educational community at large often feel they need to share victory narratives. This can make people who don’t experience life in the classroom that way feel like they’re doing something wrong. This doesn’t always help us move forward. Things that didn’t work often didn’t work for surprising reasons and we learned a great deal from why they didn’t work. One thing that was quite unexpected was how much conflict and tension there was between students. Hip-hop opened up a whole new realm of discussions. In classrooms there is often this idea that conflict is bad for learning. If students are disagreeing about something, their emotions will be engaged and they won’t be able to be rational clear thinkers. It seemed to me that those moments prompted the most growth. Even if students didn’t voice it in the moment, over the course of the term they’d describe how thinking had shifted and minds opened to new ideas. LitLive: How did you integrate these dialogues and varying views into writing assignments? A key part of being a teacher is revising what you are teaching. You have to continually respond to group needs and be prepared to deal with the fact that nobody might respond. What might work for one class, might not work for next. It’s important to improvise. It’s always beneficial to have a good background of reference material. ALOUD: Voices from the Nuyorican Poets Café. In Miguel Algarín and Bob Holman (Eds. ), New York: Henry Holt. Fisher, Maisha. 2007. Writing in rhythm: Spoken word poetry in urban classrooms. New York: Teachers College Press. Hall, Marcella Runell. 2009. Hip Hop education resources. Equity and Excellence in Education 42(1), 86-94. Hall, Marcella Runell and Diaz, M. 2007. The hip hop education guidebook: Volume 1. New York: Hip Hop Association. Hill, Marc Lamont. 2009. Beats, rhymes, and classroom life: Hip-hop pedagogy and the politics of identity. New York: Teachers College Press. Low, Bronwen. 2006. Poetry on MTV? : Slam and poetics of the popular. Journal of Curriculum Theorizing 22(4): 97<->111. Low, Bronwen. (2011). Slam school: Learning through conflict in the hip-hop and spoken word classroom. Palo Alto: Stanford University Press. Morrell, Ernest, and Jeff Duncan-Andrade. 2004. What they do learn in school: Hip-hop as a bridge to canonical poetry. In What they don’t learn in school: Literacy in the lives of urban youth, ed. Jabari Mahiri, 247-268. New York: Peter Lang. Poetry Slam: The Competitive Art of Performance Poetry. (2000) Ed. Gary Glazner. Manic D Press. Rose, Tricia. (1994). Black noise: Rap music and Black culture in contemporary America. Middletown, CT: Wesleyan University Press. Poetic license. 2001. Directed by David Yanofsky. San Francisco: Independent Television Service. Russell Simmons presents brave new voices. 2009. Directed by Stan Lathan. Los Angeles: Simmons Lathan Media Group. Slam. 1998. Directed by Marc Levin. New York: Offline Entertainment. SlamNation: The sport of spoken word. 1998. Directed and produced by Paul Devlin. The VidLit Contest voting is now closed! Coming soon: Your winners!